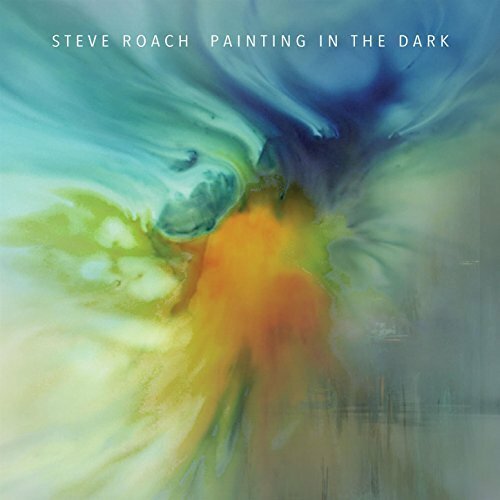 Each of Roach’s floating ambient releses seems to fall into one of several categories, one of which is the breathing organic elemental pieces that evolve slowly and push forward, unmasking textures, subtle variations, deeper drifts of pure color and tonal beauty, and slowly cascading washes, ever changing and generally amorphous. While Painting in the Dark does contain six titles, these are all part of a continuous dreamlike unfolding where the sound never stops, it just subtly shifts gears along an infinite passage that could easily play in a loop that goes on forever. At times a single tone or chord begins to emerge from a massive sea of formless textural density, only to be pulled back and swept over in an ever-changing volume of mysterious sounds. These subtle events provide a body of variation that maintain the overall forward motion throughout the six pieces, sometimes in swelling cycles of surpising regularity, and other times randomly, as ideas drift through a seemingly endless void. Throughout, all sonic changes tend to be slow moving subleties that merge together, with no sharp edges or any percussive elements to speak of. Roach’s masterful use of sonic layering and subtle dynamics makes every moment along the entire path a new revelation, dispensing with a previous idea and shining a light on what’s coming up next. In many ways, this bears styistic simlarities to his earlier collaborative album The Ambient Expanse, where subtle melodies and textures intertwine to complete a truly cosmic vision.